Labour councillors today challenged Mental Health chiefs over the ‘radical redesign’ of Mental Health services in Suffolk, raising concerns about the devastating impact the redesign has on people using the service. 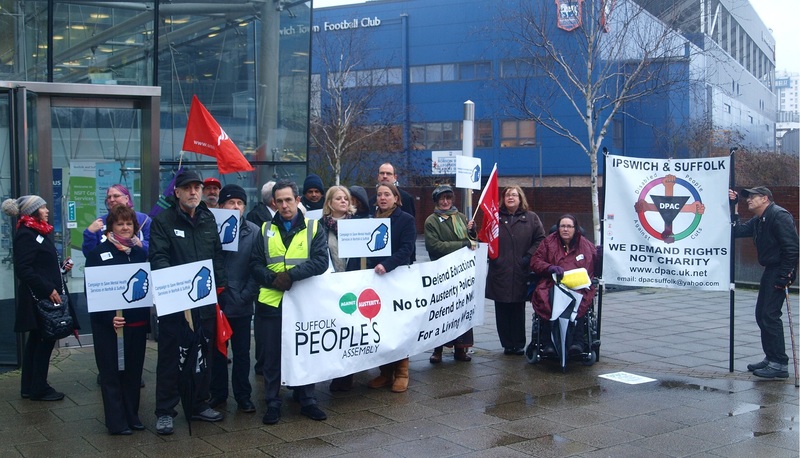 A ‘Silent Protest’ was held outside the County Council offices at Endeavour House, supported by Labour Councillors ahead of the Health Scrutiny Committee meeting. Labour is concerned about the redesign on a number of fronts. According to the Norfolk and Suffolk Foundation Trust they are spent over £14m last year on temporary or locum staff, a figure way above what would be spent if these staff were directly employed. The NSFT also confirmed that they had spent more than the £5m estimated costs on staff redundancies and had been forced to use some of their general reserves in order to pay for some redundancy costs. There is concern that the out-of-hours service is woefully inadequate with many of their mental health assessments being undertaken over the phone. Shadow Health Spokesperson Cllr Sarah Adams said; ”How you can undertake a thorough mental health assessment over the phone is beyond me, in order to make a complete assessment you need to be able to see someone face-to-face, to read body language and see a person’s demeanour. Perhaps this is the most radical part of the redesign, not seeing patients to make a diagnosis. During the meeting NSFT confirmed that there would be no immediate beds closures in the acute services and that no acute patients would be sent out of county, providing support services from other organisations were in place.